Planting a Nazgul at the Black Gate was a shrewd move on ICE's part, and until the capture of Minas Ithil makes The Teeth of Mordor as forbidding as Carn Dum and Dol Guldur. Dwar, "the Lord of Dogs", was always my favorite of the Nine for his Conan baggage. The son of a fisherman who watched his father die at the hands of brutal invaders, and who made vengeance his life's mission, is ripe for Ringwraith conversion, and there's more than a little irony in the fact that one of the PCs I flung against this fortress was a barbarian with similar issues. The Morannon has plenty of baggage itself, or at least by my revisions; I got creative by investing it with a "split-personality", as if Carchost and Narchost were a fossilized Demogorgon whose two heads strive to dominate and kill each other. Alas, I don't remember this idea coming across too well in game play, and in the end had to enjoy my abstract perversities as a private joke. There is some question as to when Dwar occupied the Teeth, and this module puts it relatively late: "It is not until 1980 that light returns to the windows of the Morannon: dim red lights like demon eyes to stare unsleeping across the Dagorlad." This admittedly fits cleanly into Tolkien's timeline, where the Witch-King comes to Mordor the same year and vaguely "gathers" the other Nazgul. 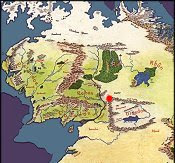 But in later modules like Gorgoroth, Dwar moves in as early as 1656 -- only sixteen years after Gondor's abadonment -- perhaps to provide a bigger window of opportunity before the Nazgul launch their war on Minas Ithil and take up residence in the city. It's the more liberal interpretation, and not surprisingly, the one I prefer. 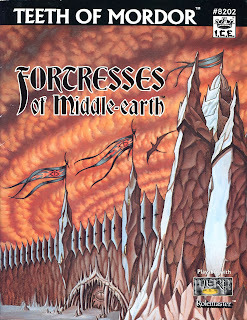 The layouts magnify the miniscule, like those in Weathertop and Halls of the Elven-King, and again it's a shame this fortress series never went far. On the western end, Carchost the "Fang-Fortress" has the obscene interrogation chambers and perverted chapel run by an ancient priest. But the astrologer captain Krusnak steals the show (in my fantasy), as he schemes to bring down Dwar whom he worships but envies. He wants nothing less than to become the Third of the Nine, and one out of four evenings actually believes he is the Dog-lord. He plots to obtain the ring of power he believes Dwar has in his possession (clueless that Sauron keeps the Nazgul rings during the Third Age while the One is lost). I made him recklessly unstable, though one of Sauron's most efficient inquisitors, and his derangement contagious; at night the tower's soldiers go on mindless rampages, terrorizing the wastelands at the back of Dwar's hounds -- joined, every fourth evening, by the "Dog-lord" himself. Over at the eastern leg, the real Dog-lord, for his part, tolerates this insanity, while storing up wrath to rend his astrologer limb from limb. Narchost the "Fire-Tower" mirrors the structure of Carchost, but "has its own personality" given by ICE, and which I revved up to the nth degree. The volcanic fissure makes Dwar's audience hall a harrowing encounter area: a throne set in front of the crack, on a stepped platform of black glass, with access to the platform via a narrow bridge arching over liquid rock, and everything in the room obscured by smoking black-red shadows. I got a good chortle landing PCs in that scalding inferno and reduced to near impotence. As for Dwar himself, he's as hate-driven as Krusnak is insane, but intelligently controlled, and this manifests in the Fire-Tower's highly disciplined soldiers so unlike their wild cousins a few hundred yards across. Only their brutal efficacy, and Sauron's high esteem of Krusnak, keeps Dwar from razing Carchost to the ground. 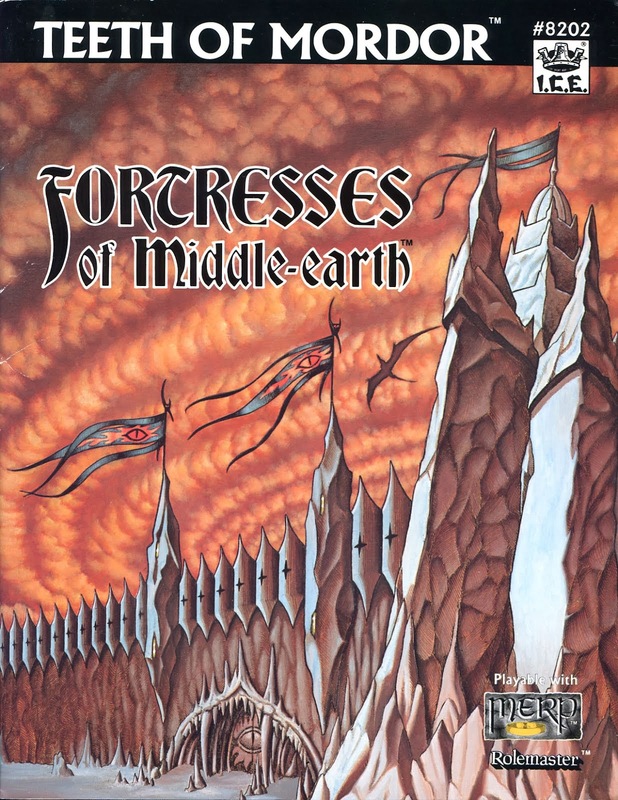 The Teeth of Mordor is a fond memory for all the weird energy I put into it. If it didn't come together quite right, it was still roaring fun to get so much mileage out of my favorite Nazgul -- "both" of them, for that matter. Next up: The Tower of Cirith Ungol and Shelob's Lair.